Even people who have spent a lifetime responding to natural disasters have a hard time grasping the enormity of the devastation caused by firestorms that raged through large swaths of the Methow Valley and surrounding areas, leaving hundreds of people homeless and traumatized. “This is nothing short of a national disaster,” said Rex Reed, deputy commander of the Washington Incident Management Team (IMT) stationed at Liberty Bell High School. “I’ve never seen anything like this, of this magnitude, with the type of infrastructure damage we have,” said Reed, who has 40 years of experience fighting fires. “This is something you hope you never see in a career,” Reed said this week. The Carlton Complex Fire reached 250,136 acres—390 square miles—on Tuesday (July 22), making it the largest fire in Washington history, and the top-priority emergency in the nation. The devastating impacts on the lives of Methow Valley residents included one fire-related death, and the loss of houses, pets and livestock. Life-as-usual came to a halt last week with the loss of power and means of communication including cell phone, long-distance and Internet services. Even people not directly threatened by the fire grieved over others’ losses. Some said they felt a sense of guilt because they were not in danger. The community as a whole is struggling to understand the profound impact of the disaster on the valley now and in the future. “Recovery will be months and years in our future,” Reed said Tuesday. Firefighters battling the growing wildfire got a much-needed assist this week as temperatures dropped and rain arrived Tuesday, allowing them to complete a fire line along the western perimeter of the fire, providing 16 percent containment of the huge wildfire. As of Tuesday the fire line ran along the east side of Highway 153 beginning near Yellowjacket Road and continuing along the Twisp-Winthrop Eastside Road, Davis Lake Road and Beaver Creek Road. Rain that was expected to continue through Wednesday evening helped firefighters, but also prompted flash-flood warnings for areas burned by wildfires. The weather for the rest of the week was expected to be sunny. A total of 2,110 people were working on the fire this week, about 1,000 of them firefighters, according to information officers with the Incident Management Team (IMT) directing firefighting operations. The southwest portions of the fire zone—Libby Creek and Gold Creek—were the most troublesome areas at the beginning of the week, as fire crews worked to establish a containment line around fires in those drainages. Those two areas were still under Level 3 evacuation orders (meaning leave immediately) at press time. “This is really nasty country—rugged terrain, not very accessible,” John Pendergast, an operations specialist with the IMT, said Tuesday. The community of Carlton, which had been placed at Level 3 Monday, was a Level 2 Tuesday. 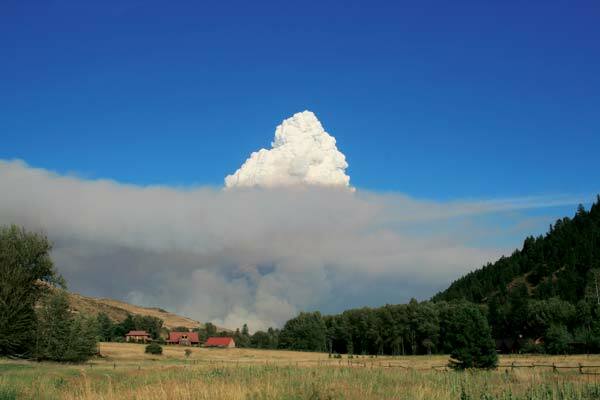 Fire strategists want to establish a containment line using shovels and bulldozers to quash the Libby Creek fire’s ability “to hook into the back door to Twisp,” said Jim Archambeault, a public information officer. 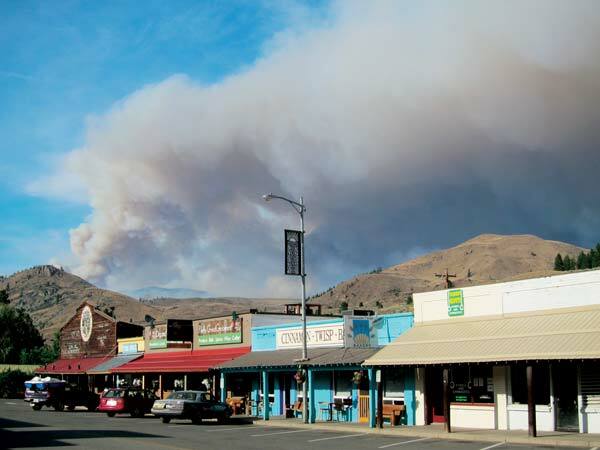 Residents in the town of Twisp endured an anxious night on Friday (July 18) when strong winds pushed fire toward the town from Balky Hill. The town was put on Level 2 evacuation (telling people to be ready to leave), as flames were visible on the ridge above town. The evacuation order was downgraded to Level 1 on Saturday afternoon after fire crews built a hand line and tankers dropped retardant to contain the fire. Strategies for fighting the fire include a planned burn-out to secure the northwest flank of the fire, in the hills north of Pearrygin Lake. The burn-out will “tie in with the Tripod fire [which burned in 2006] footprint to lock out the northwest part of the fire,” said Pendergast. Rain delayed plans to begin the burn-out. When conditions improve, the burn-out will be conducted, and residents can expect to see increased smoke conditions at the north end of the fire. 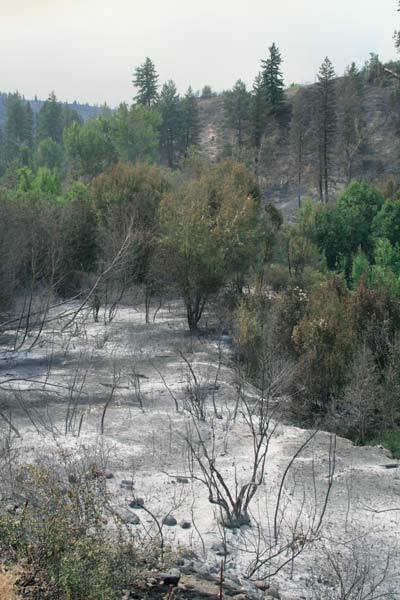 Touched off by lighting storms on July 14, the Carlton Complex Fire roared to life, fed by strong winds, low humidity, high temperatures and tinder-dry vegetation. Even nightfall—which usually can be counted on to reduce the hazardous conditions—provided little relief during the first five days of the fire. “It’s a perfect alignment” of conditions for disastrous fire, said Don Waller, Okanogan County Fire District 6 chief. Lightning sparked four separate fires on the afternoon of July 14; three located in the vicinity of Carlton and another, the Cougar Flat Fire, east of Pearrygin Lake. Blown toward the southeast by winds gusting to 35 miles per hour, the fires merged together by week’s end into an enormous conflagration that reached the Columbia River, the Okanogan Valley and was threatening Chelan. Firefighters and equipment—including planes and helicopters—poured into the valley from around the country, but the onslaught was no match for the extreme conditions until the weather changed. County emergency officials esimate 100 to 200 structures have been destroyed, although it is not clear how many of them are homes. It’s still too dangerous to enter some areas to assess damage. Miraculously, only one fire-related death was reported as of Tuesday evening (July 22). A Gold Creek resident died of a heart attack while working to protect his home Saturday. After periodic closures of Highway 153 from Carlton to Pateros on Thursday and Friday (July 17 and 18), the highway was reopened to traffic on Saturday. The scorched landscape south of Libby Creek immediately after the fire was almost apocalyptic—stark hillsides with blackened, smoldering trees rising from barren ground covered with white ash, and clouds of blowing ash in the smoke-filled air. Charred, broken power poles, some still flaming, dangled from electric lines. Other poles lay on the ground amidst a tangle of power lines that resembled “a big bunch of spaghetti,” as one Okanogan County Public Utility District official described it. Where houses once stood, only smoldering piles of twisted metal and perhaps remnants of a chimney remained. Other houses and structures—especially those surrounded by irrigated fields, lawns or orchards—were intact. Many houses appeared to have been saved by firefighters and sat, unscathed, in a bare and blackened landscape. Some homes appeared to have survived due to the irregular path of the fire. In Pateros, there were scenes of appalling devastation as a result of the firestorm that swept down the Methow Valley and engulfed the town Thursday night (July 17). The fire obliterated nearly two square blocks, but other homes and the Pateros business district were unscathed. The fire also burned the town’s water tanks, prompting orders to all residents to boil water. Because of its size and complexity, the Carlton Complex Fire was split into three management zones Sunday, with new Incident Management Teams based in Omak and Chelan joining the team headquartered at Liberty Bell High School. The school campus has become a makeshift city, with hundreds of sleeping tents for firefighters, portable showers, fuel and water trucks, and an array of firefighting rigs. Inside the school, classrooms have been transformed into communications and planning centers. A Red Cross shelter for displaced residents was initially set up at the Twisp Grange, but was moved to the Winthrop Barn when Twisp was placed under Level 2 evacuation. Many people who lost their homes, or were forced out by evacuations, sought shelter with friends, slept in campers and tents, rented hotel rooms, or left the valley. 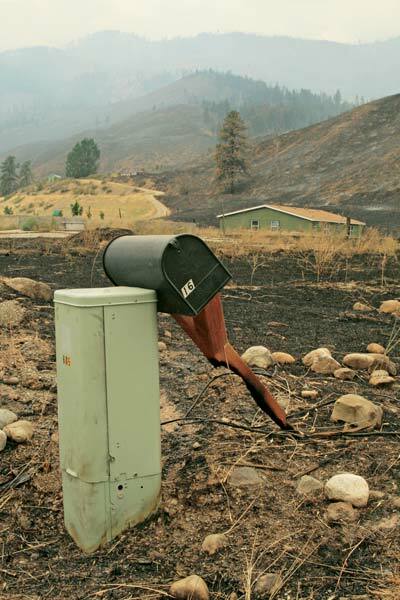 Intensifying the confusion and fear about the growing fire was loss of power and most modern forms of communication when the main transmission line to the valley over Loup Loup Pass was damaged by fire Thursday (July 17). Residents lost Internet, cell phone and long-distance services. People with landlines found those to be working intermittently. Even U.S. Postal Service mail delivery was interrupted Friday and Saturday due to road closures. Many residents were unable to contact anxious family and friends outside the Methow Valley, who were worried by growing news and social-media coverage about the devastation occurring in the valley. Communications within the valley became face-to-face conversations and notes left on doors. Residents gathered around information boards set up by the Incident Management Team at locations around the valley for the latest updates on the fires and to exchange stories. Communications appeared to be slowly returning to normal this week. The Cougar Flat Fire destroyed four miles of the Okanogan County Public Utility District transmission line on the west side of Loup Loup Pass on Thursday, July 17 (see related story). As it became clear that power would be out for some time, valley residents began improvising ways to survive. People formed long lines at gas stations, and local hardware stores sold out of power-outage necessities such as batteries, camping stoves, flashlights, generator fittings, electrical fittings, sprinklers, hoses and solar showers. New supplies were being ordered. “Everybody’s just trying to survive,” said Mason Brandt, manager of the Winthrop Ace Hardware store in Winthrop. The power outage, predicted to last several weeks for residents in some of the most-damaged areas of the valley, prompted a rush of generator purchases. That concerns PUD officials who worry that improperly used generators could endanger line crews working to fix lines, and slow the process of restoring power. National Guardsmen arrived in the Methow Valley this week and will begin making door-to-door visits in burned areas, when it is safe to do so, to conduct “a community wellness check,” Reed said. “There are lots of traumatized folks … people hanging back not knowing where to go” for help, Reed said. As the fires raged, there were reports from devastated homeowners about firefighters who seemed not to have done all they could to protect a house, but other people had nothing but praise for their work. “They did a really skillful back burn—they saved the house,” said Deborah Whittemore, who spent the night with her husband in their truck at a friend’s house after they saw the fire coming toward them. “It was very heartening to see the big army helicopter dropping water on our barn,” she said, noting that the firefighters had also moved their hoses to wet down their barn. There has been a flood of donations to help fire victims, said Mike Dingle, an emergency management liaison. In fact, a donations center at the Agri-Plex in Okanogan is so overwhelmed with food, clothing and other supplies that it may have to stop accepting donations, Dingle said. 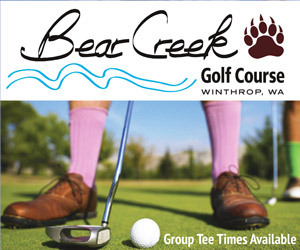 “The best way people can help is cash donations to reputable organizations like the Red Cross,” Reed said. Okanogan County Emergency Management is also able to accept donations for fire victims, he said. 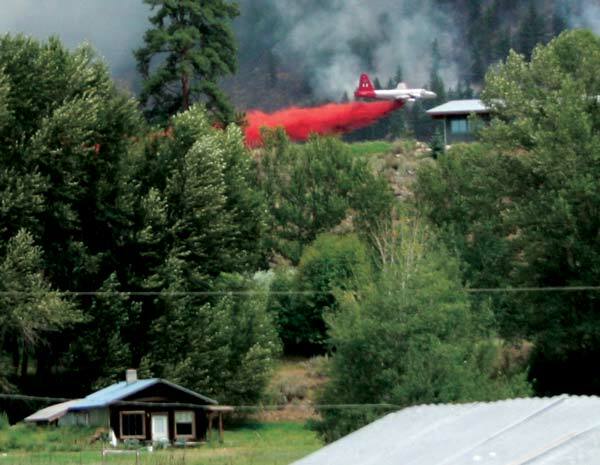 In addition to the heart attack victim, Aero Methow Rescue Service reported two other serious medical incidents related to the fire. A firefighter sustained injuries in a fall last weekend and was transported to Harborview Medical Center in Seattle. Another individual was injured trying to evacuate animals. Cattle ranchers were trying to locate cattle that had been grazing on range land burned by the wildfires. County Commissioner Ray Campbell said rancher Cass Gebbers lost 160 head of cattle when the fire crested Loup Loup Pass and raged through the Chiliwist area near Malott. An unknown number of homes were destroyed in the fire. Campbell said the wildfire will have long-term implications for cattle ranchers as a result of grazing areas lost to the fire, and alfalfa crops that may be lost because they are not being irrigated during the power outage. In addition to Pateros, other areas under orders to boil water include Wolf Creek, Lost River Airport, Alta Lake and the town of Methow, according to county emergency management. Two men were arrested on arson charges over the weekend, said Okanogan County Sheriff Frank Rogers. Methow Valley resident Larry Smith, 63, was arrested Friday after he set a back burn in an attempt to protect a Benson Creek property. “Somebody called him and he went to Benson Creek … and did a back burn and ended up burning someone else’s property,” Rogers said. Radley J. Hastings, 62, of Antoine Creek was also arrested on arson charges, Rogers said.